EBay is a wonderful thing, isn’t it? Whatever it is that you need, you can log on and find it within seconds, bid on it and within minutes or at the latest, within days, you can be holding that item in your hot little hands! But if you’re bidding on an item that you really, really want, you’ll need to make sure that you’re able to log in any minute of the day, and make sure that no one’s outbid you. Not to mention if you’re a seller on eBay. In that case, you’ll need to keep in constant contact with your buyers to answer questions and make sure their concerns are taken care of. 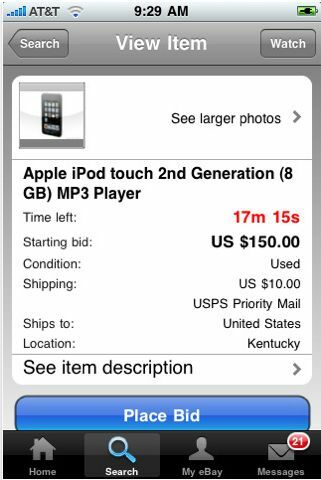 Now, you can do all of this with eBay Mobile for the iPhone. This handy little iphone app will let you view all the items eBay has for sale, search specific categories, and of course, keep track of everything in your account. So whether you’re in a bidding war with another buyer, or you just need to keep an eye on some items you’re watching, you’ve got access to everything you need right at your fingertips. And all of it is so much easier than using the Safari browser to do it. And when you take into account that it’s all free, what have you got to lose? So the next time your friend mentions the rare copy of that book that they’ve been wanting, you can just plug in the title and come through as hero of the day! First though, you need to download the free app, which you can find here. How to Transfer Games to iPod Touch?